Few things feel as good next to skin as silk. Intimo's Classic Silk Boxers will prove the point the moment you slip into them. Featuring a traditional cut, these smooth boxers have a discreet two-button fly and a comfortable waistband. Great for sleeping for all-night comfort, you have to slip them on to truly appreciate their silky appeal. INTIMO: Intimo was founded with the philosophy that everyone deserves an escape into the world of comfort and luxury. Our sleepwear and underwear integrates fashion, innovative fabrics, fit and uncompromising comfort in a high-quality product that sets the standard for both look and feel. PREMIUM SILK FABRIC: Enjoy the feel of 100% pure 16.7 mome silk charmeuse against your skin. 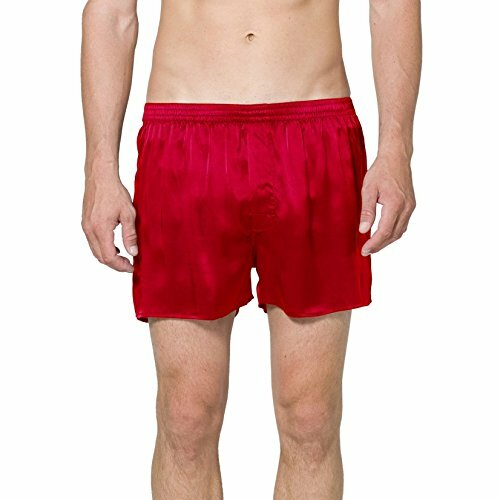 Our silk boxers feature a four track fully silk covered and elasticized waistband, discreet two-button fly, and side slits for ease of motion and comfort. EASY CARE INSTRUCTIONS - Our silk products are not only luxurious and comfortable but are also easy to care for. Washing instructions are as follows: Machine wash cold on gentle cycle with like colors, do not bleach. Tumble dry low or line dry. If you have any questions about this product by Intimo, contact us by completing and submitting the form below. If you are looking for a specif part number, please include it with your message.